Here's good news for seasonal eaters. Unlike most leafy greens, kale reaches its nutritional peak during the coldest months of the year. It's packed with vitamins A, C, and K, as well as iron, calcium, and antioxidants like carotenoids and flavonoids. Plus, it's so versatile that you can put it in almost anything. It works well as a salad, soup, or side dish, and can be substituted for cabbage or spinach in most recipes. 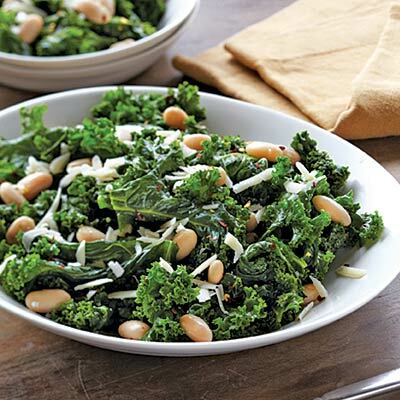 It's a key ingredient in this nutrient-rich, easy-to-make Beans & Greens recipe. Clocking in at a mere 126 calories per serving, it's low in fat and high in fiber to help you maintain a healthy weight. It makes an amazing, healthy side dish. But if you want to turn this recipe into a hearty entree, just toss in some whole-wheat pasta. And don't be afraid of the extra carbs: complex carbohydrates give you energy, stabilize your blood sugar and make you feel full for longer.